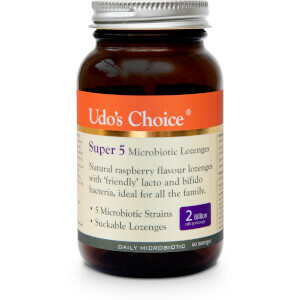 Udo's Choice Super 5 Microbiotics provide easy-to-consume raspberry flavoured lozenges containing 5 specific strains of ‘friendly’ bacteria (probiotic) to support the immune system functionality and encourage proper digestion. Microbiotics are the beneficial lacto and bifido bacteria that occur throughout the digestive tract and are essential in replenishing healthy gut flora, which helps to reduce gas, bloating and constipation. 2 billion cells per lozenge, including: Lactobacillus acidophilus: 60%, Lactobacillus casei: 15%, Bifidobacterium bifidum: 15%, Lactobacillus rhamnosus: 5%, Lactobacillus salivarius: 5%. Maltodextrin (Dilutent), Xylitol (Sweetening Agent), Microcrystalline Cellulose (Binder), Natural Raspberry Flavour (Flavour Enhancer), Freeze-Dried Bacterial Cultures, Ascorbic Acid (Antioxidant), Magnesium Stearate (Emulsifier), Citric Acid (Acidity Regulator), Silicon Dioxide (Flow Enhancer).